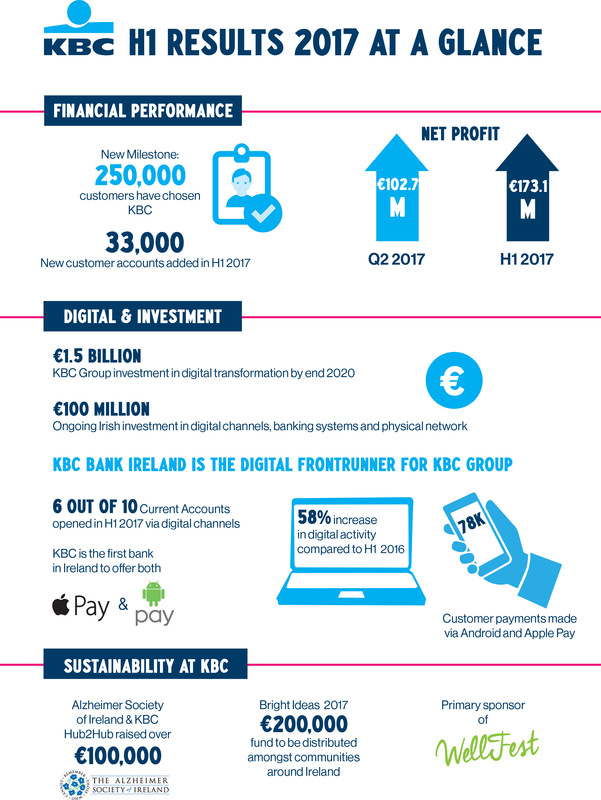 For some time now, KBC has been committed to delivering a customer-centric digital-first strategy and the results of the bank’s latest report reveal that these efforts have begun to pay off. In the last 12 months, KBC has made several decisive moves to make the bank a lot more digital friendly. It became the first bank in Ireland to allow customers to open a new current account online (both via your computer and via your mobile device) and it led the charge amongst other banks by becoming one of the first to make Android Pay and Apple Pay available to its customers (apps that allow you to pay for items online or at a check-out by simply tapping your phone to a point-of-sale terminal). Well, it seems that these new introductions made all the difference to the bank, as new figures released today show that customers are embracing digital banking with KBC. In the first half of 2017, six out of 10 current accounts opened with the bank were opened via digital channels. This figure is up 58% from the same period last year. There has also been a considerable increase in mobile traffic as customers migrate to favour mobile banking; total mobile transactions are nearly 10 times greater than total online transactions. Finally, the new figures indicate that customers are loving Android Pay and Apple Pay as 78,000 customer payments were made via the new apps in the first half of 2017. Digital has been steadily taking over many parts of our lives for the last number of years so it’s no surprise that customers are taking readily to digital methods of banking. Mobile banking and handy apps like Android and Apple Pay ensure that everyday transactions are secure and easy to make, not to mention the fact that they help to keep banking fees down. Currently, no banks charge for contactless payments (excluding Bank of Ireland which currently charges 1c per transaction) and this includes payments made using Android and Apple Pay. Withdrawing cash from ATMs costs 30 cent every time with KBC so paying digitally makes a lot of sense. We recently explored the best way to pay for everyday items, if you're interested in learning more. Like the sound of KBC? Like the sound of KBC but don’t have an account with them? Why not check out their account offerings? If you’re in the market for a current account switch don’t forget to compare all your options before you make any final decisions.